Northwest coach Jason Smith talks to his team in a timeout during Tuesday’s 55-40 loss at Huntington Ross. Northwest’s Brayden Campbell guards Elijah McCloskey during the first half of Tuesday’s 55-40 loss at Huntington Ross. CHILLICOTHE — When Elijah McCloskey is held to just three points in a ballgame, usually, that spells out trouble for Huntington. In fact, if you would’ve told Northwest that McCloskey was going to be held under 10 points in Tuesday’s non-league battle, the Mohawks would’ve jumped for joy. Unfortunately for the Mohawks, however, McCloskey’s teammates Seth Beeler and Nate Snyder were present to pick up his slack, scoring a combined 45 points. That duo’s production was ultimately the source of Northwest’s doom in a 55-40 loss on the road. 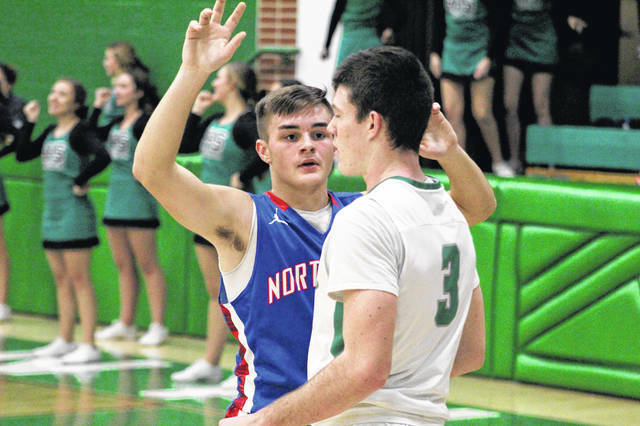 While Beeler and Snyder took advantage of their scoring opportunities at will, they received them thanks to the relentless defense of Northwest’s Brayden Campbell. Campbell, a freshman, was relentless in his hounding of McCloskey. The Mohawks, playing a box-and-one, denied Huntington’s star guard at all costs and used Campbell to do so. Last week, Campbell held Wheelersburg’s Tanner Holden to seven points. After McCloskey scored 44 points in a game last weekend, Campbell didn’t allow him to hit a single field goal. Beeler hit the game’s first field goal, a 3, to give Huntington an early 6-2 lead. Northwest’s Braden Borens answered with a 3 of his own, cutting the lead to 6-5. The Huntsmen then went on a 6-0 run, led by Snyder, before taking a 12-7 advantage into the second quarter. Throughout the rest of the first half, both teams struggled mightily to put the ball in the basket. Snyder hit another 3 with 2:33 left, making it 19-9, before his Huntsmen took a 21-11 edge into the break after winning the second quarter by a 9-4 margin. In the third, Huntington built a 28-13 lead before heading into the final eight minutes up 31-18. The Mohawks then ripped off an 8-1 run, cutting the lead to 32-26, but mental mistakes down the stretch allowed Huntington to answer with a 7-0 run, ultimately pulling away for good. McClay led Northwest with 14 points and eight rebounds while Crabtree added 10 points, four boards and three assists. Borens finished with seven points while Timmy Emmons grabbed seven rebounds. Beeler paced the Huntsmen (5-12) with 26 points while Snyder followed with 19 of his own. DJ Kinzer ended the evening with seven rebounds and a team-high two assists. 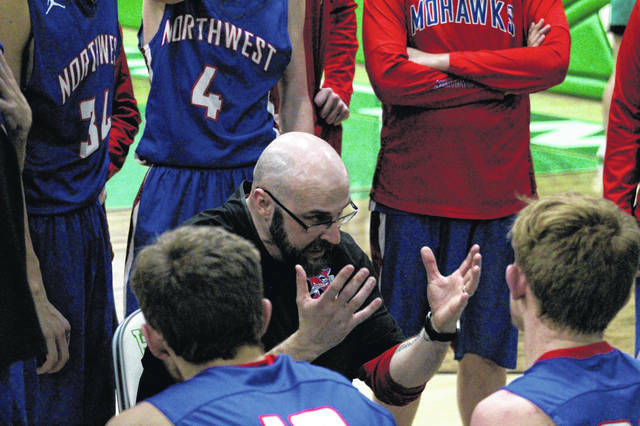 Things don’t get any easier for Northwest as they prepare for a trip to South Webster Friday. Northwest: 14-48 FG, 9-13 FT, 3-15 3pt. (McClay 2), 29 rebounds (McClay 8), 16 turnovers, 3 assists (Crabtree 3). Scoring: McClay 14, Crabtree 10, Borens 7, Campbell 5, Emmons 2, Hall 2. Huntington: 16-42 FG, 20-26 FT, 3-19 3pt. (Snyder 2), 25 rebounds (Kinzer 7), 9 turnovers, 4 assists (Kinzer 2, Fisher 2). Scoring: Beeler 26, Snyder 19, Haubeil 5, McCloskey 3, Kinzer 2.
https://www.portsmouth-dailytimes.com/wp-content/uploads/sites/28/2019/01/web1_Northwest.jpgNorthwest coach Jason Smith talks to his team in a timeout during Tuesday’s 55-40 loss at Huntington Ross. https://www.portsmouth-dailytimes.com/wp-content/uploads/sites/28/2019/01/web1_Campbell.jpgNorthwest’s Brayden Campbell guards Elijah McCloskey during the first half of Tuesday’s 55-40 loss at Huntington Ross.